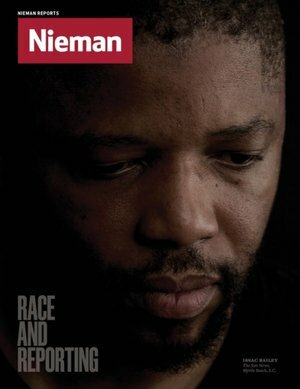 June 16, 2015, 10:39 a.m.
By Alicia W. Stewart June 16, 2015, 10:39 a.m.
Editor’s note: Our sister publication Nieman Reports is out with its new issue, including a cover package focused on race and reporting in America today. Here 2015 Nieman Fellow Alicia W. Stewart writes about the strategies newsrooms — from Vox to The Washington Post, BuzzFeed to The Atlanta Journal-Constitution — are employing to diversify. The commission, tasked with determining the causes of and finding solutions for the riots that had been scarring the country for much of the decade, singled out the media for their inadequate coverage of African-Americans. “It would be a contribution of inestimable importance to race relations in the United States simply to treat ordinary news about Negroes as news of other groups is now treated,” the report stated. The Kerner Report also criticized newsrooms for the disproportionately low percentage of minorities employed in the industry. Today, with attention turned to race relations in cities like Ferguson, Baltimore, and Cleveland, the needle on inclusion in mainstream newsrooms seems stubbornly stuck in place. The number of journalists of color has slowly climbed since the Kerner Report’s release, peaking around 2008, but that hasn’t necessarily translated into more equitable coverage. In a 2014 study by the American Press Institute and the Associated Press-NORC Center for Public Affairs Research, only 25 percent of African-Americans and 33 percent of Hispanics said the news media accurately portrayed their communities. POSTED June 16, 2015, 10:39 a.m.
Stewart, Alicia W.. "From Nieman Reports: Newsrooms find a diverse masthead means better coverage and new audiences." Nieman Journalism Lab. Nieman Foundation for Journalism at Harvard, 16 Jun. 2015. Web. 23 Apr. 2019. Stewart, Alicia W.. "From Nieman Reports: Newsrooms find a diverse masthead means better coverage and new audiences." Nieman Journalism Lab. Last modified June 16, 2015. Accessed April 23, 2019. https://www.niemanlab.org/2015/06/from-nieman-reports-newsrooms-find-a-diverse-masthead-means-better-coverage-and-new-audiences/. | first = Alicia W.